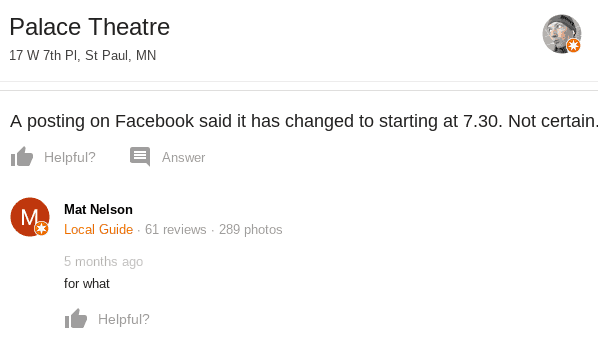 Who is Answering Your Google Q&A Live Music Venue Questions? First, a well thought-out article by Joy Hawkins, one of the best local search minds that help answer the questions above. 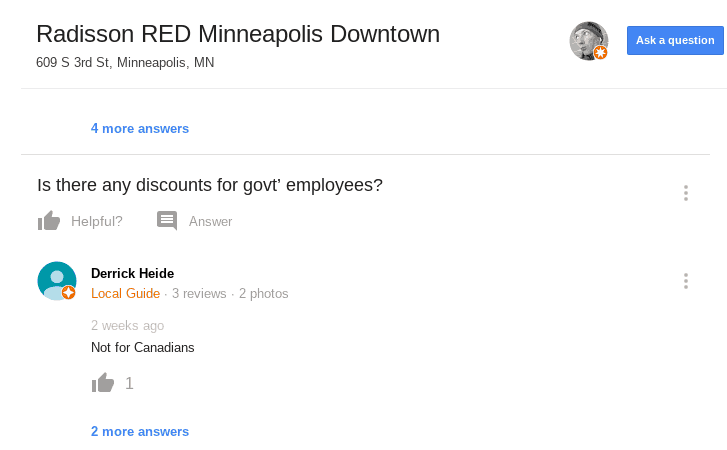 For the Q&As, here’s a standard example for one in the Twin Cities. It’s funny, not sure what the intent was, but it’s something that Radisson Red would want to handle and own. Typically, a few different types of people are asking questions. You have a legitimate crowd asking asking for directions, parking, hours of operation, and ADA compliance info. You’ll also have questions answered by Google Local Guides. A few are there to rack up system points, but most are helpful, legit and carefully-written by the user. For live music venues, the number of questions usually escalates. 10 questions as shown below for the Turf Club. A good majority of them are legit from their concert goers, some aren’t, but the venue staff should be ready to answer these questions, and own them. A concert goer can then be happy knowing that someone with authority is listening to them. Of course, you may see this. Most likely, this is a question the day of a show. A manager at the venue could see this and more appropriately answer the question. Just like any industry, you’re also prone to a few who have a bone to pick and will specifically use Google’s Q&A to address their dirty laundry instead of their ratings and reviews feature, most likely because their Q&A is a bit more visually prominent (IMO). Whichever the case, answers are written about YOUR business. Positive or not, wouldn’t you want control to answer these questions concisely and accurately, and how you want your own brand represented? To do this on the fly, you want to have the Google Maps app on your phone. You probably already do for other numerous reasons anyway. Once downloaded and signed in, you can Google your business name and answer questions as you, your company name with a profile photo to help ensure authority. Article written by Paul Jahn of LocalMN Interactive. We help local businesses with customizing Google My Business listing as well as local search and WordPress web development. 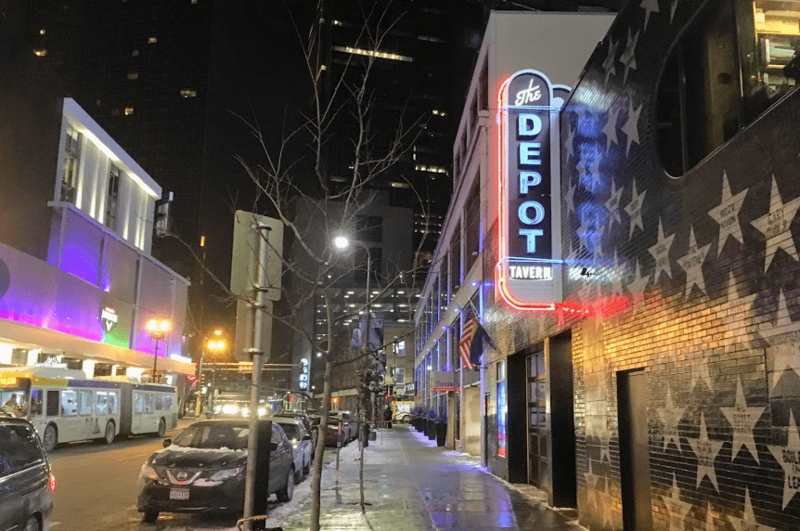 https://localmn.com/wp/wp-content/uploads/2018/03/depot-tavern.png 572 862 Paul Jahn https://localmn.com/wp/wp-content/uploads/2017/05/Screenshot-2017-05-02-at-6.30.33-AM.png Paul Jahn2018-03-29 21:16:202018-04-06 17:37:59Who is Answering Your Google Q&A Live Music Venue Questions?